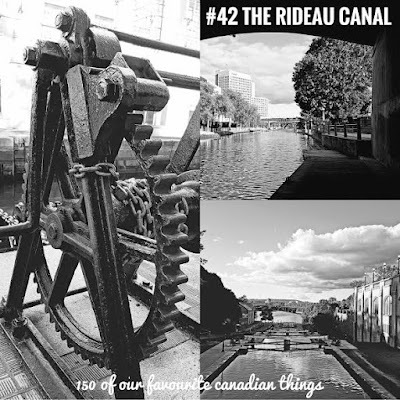 The Rideau Canal was opened in 1832. It was originally created in case of war with the United States. After the war of 1812, the Rideau was constructed as a means to transport supplies and communication between Montreal and the British naval base in Kingston. This allowed Canada to by pass the part of the St Lawrence River that ran along the border of New York. In current times, the canal is just used for recreation. In winter, the canal is flooded and becomes the world's largest skating rink. The total surface area equals about 90 ice hockey rinks! It runs from Carleton University to the Parliament buildings. Once the rink opens for the season, it remains open 24 hours a day until the end of it's season. The season varies from year to year according to weather conditions. Every year the rink is the focus of the Ottawa Winterlude festival. In the summer, the waterway is used by many different boats and can accommodate boats as large as 90 ft in length! Feel free to tour along the waterway in your own boat, or jump aboard a boat tour! Boat tours are offered along the waterway in various communities. 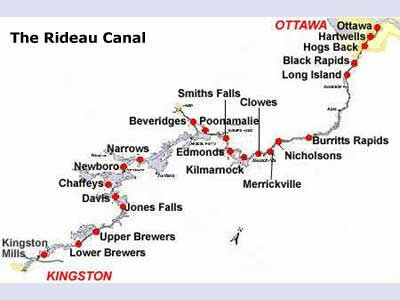 The canal spans 202 kms and runs from Ottawa all the way to Kingston, Ontario. There are a total of 45 locks, and most of them are hand operated. While you can boat from one end right to the other, it would take you about 3-5 days by motorboat. Now, despite what you may think, it's not its' size that matters to me, it's the history. This is what I love about the Rideau! You can almost feel the history just by standing at the locks by Parliament. The feeling you get when you are standing on a spot that someone stood on over 150 years ago is just amazing. It's the history that our country, especially the Ottawa area, is so rich in, that truly make Canada great! When a "land mark" is part of over 12 communities in Ontario, it's definitely something to take notice of. More than just a big skating rink, more than just a river, this is history. This waterway is a statement to some of Canada's earliest engineering tenacity! Well done Canada, well done!